New York, Robert Miller Gallery, Joan Mitchell, October-November 1989, n.p. (illustrated in color). "I paint from remembered landscapes that I carry with me--and remembered feelings of them, which of course become transformed. I would rather leave nature to itself. I would like more to paint what it leaves me with" (J. Mitchell quoted in J. Baur, Nature in Abstraction: The Relationship of Abstract Painting and Sculpture to Nature in Twentieth Century American Art, Whitney Museum of American Art, New York, 1958, p. 75). 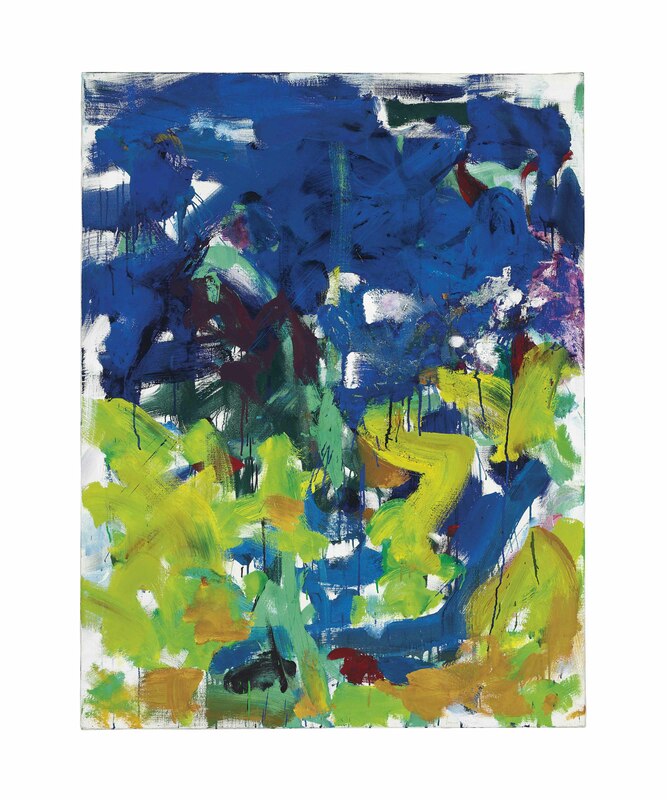 Joan Mitchell's lyrical abstract compositions, such as Border, 1989 are closely tied to nature, reflecting the artist's continual devotion to landscape, a characteristic that distinguishes her from her Abstract Expressionist contemporaries. One of only a few female artists associated with the movement, Mitchell is primarily concerned with the complexities of emotion and the memory of nature, not simple scenes or subjects. Composed of striking blue, green and lavender tones, the present lot is a stunning example from the artist's late career. The rich coloration and intensely energetic brush strokes are hallmark signs of the artist's work, particularly that of her paintings from the early to late 1980s. Joan Mitchell was one of the most important abstract expressionist painters of the 20th century. She started her career in New York in the 1950s, and spent her formative years amongst the Cedar Tavern crowd in downtown New York and worked closely with Franz Kline and Willem de Kooning and took classes with Hans Hofmann. In the late 1950s, she moved to Paris where she earned further recognition and success. She spent the remainder of her life living and working in the south of France, which would have considerable influence on her painting. Mitchell was often inspired by nature and the landscape around her home in the south of France, leading many to compare her work to the work of 19th century masters, Claude Monet and Vincent Van Gogh. Her later works from 1980 through the end of her life in 1992, in particular, demonstrate her love of and appreciation of these two artists and "expand upon those artists' comprehension of abstraction" (Richard D. Marshall, "Joan Mitchell: The Last Decade 1982-1992," Joan Mitchell: The Last Decade, exh. cat., Gagosian Gallery, Beverly Hills, 2010, p. 7). In Border, Mitchell loosely references a landscape with the rich blues in the upper register and bright greens and yellows in the lower register. Mitchell's brilliant use of color and her expert handling of the paint on the canvas create a moody, emotionally charged abstract landscape that is akin to Van Gogh's late paintings from his time spent at Arles in the French countryside. Throughout her career, Mitchell was consistently engaged with exploring the creative and expressive possibilities of paint, and Border exemplifies her at the culmination of her journey as an artist. Mitchell is celebrated for the palpable energy with which she applied paint to the surface of the canvas. The urgent gestures, extraordinary color, and open, lyrical composition of Border all combine to create an important and extraordinary work of the artist's oeuvre with strong ties to both European and American art history.